This is the cold truth: you will make a lot of life-changing decisions throughout your life and believe it or not, buying a house ranks among them. This is why many first-time buyers find this as a source of stress – doubly so, when home financing comes into the equation. You’ve probably grown accustomed to renting and budgeting for the monthly cost of renting which normally includes your rent, a few utilities, internet, and cable bills. As a homeowner, your responsibilities will grow because you now have to take care of things that previously your landlord took care of. This will include water, sewer and garbage bills, monthly HOAs (if you’re purchasing a condo unit), and the cost of lawn care. Oh, let’s not forget the property taxes and homeowner’s insurance. Did we mention maintenance cost already? That will also be part of your out-of-pocket expenses. We suggest that you set aside 1%-3% of the purchase price of your home every year for your repairs and maintenance budget. 2. Searching For Your Dream Home Before Prequalifying For a Loan. Many homebuyers have set themselves up for disappointment by doing this. Spare yourself the heartache of not being able to afford the house you dream of by letting the bank prequalify you before you start house hunting. Don’t go around picking a house price range and searching listing until you’ve talked to a lender. Take time to find out first what’s the house you can realistically afford and what the monthly payment will be. Of course, you should include all the taxes and other fees of the bank. When you know the amount that the bank will preapprove for you, you can make a realistic budget for your home search. Admit it: if you’re new to the homebuying game, there are a thousand things you have no idea of in the process. You’ll really need a reputable real estate agent, a good loan officer, a veteran broker, and in some cases, a lawyer familiar with real estate laws. Venturing into this process on your own, without a professional to guide you, is a very risky move. Here’s a simple rule to remember: if you’re a first-time homebuyer, don’t try to deal directly with the listing agent. Consider this: if you are getting a divorce, would you go to your spouse’s attorney for help? The principle is the same here. If you go directly to a listing agent, they are only going to offer to you their listings. A buyer’s agent would be of more help because he will show you more listings. If you are hiring an agent from out of an ad or a website and without a referral from friends and family, ask him to provide you with references from previous buyers. Do the same for loan officers or mortgage brokers. It’s quite hard for first-time homebuyers because basically, they have no idea who they are dealing with. They can’t just rely on first impressions. It’s important to find a professional who will give you unbiased and independent advice. Sometimes, this would mean getting the services of a lawyer. Yes, you have that monthly mortgage payment down pat but have you considered the cost of home maintenance, utilities, and property taxes? If you are purchasing an older home, you should remember that you might be needing money for repairs and renovations. While the total selling price will give you a fair idea of what you will pay for your house, you must look at all of the extra costs necessary to maintain your home and pay property taxes. Your lender or realtor may not be able to give you accurate information about this matter so it is better to do your own research. You may ask a home inspector for a list of existing or potential problems you may encounter in the near future. Ask for quotes from renovation specialists or builders in the area to have an idea of potential updates and home improvement projects. Also, don’t ignore moving costs and cost of extra furniture you might need to buy to fill up a larger living space. Many homebuyers think they need more money for a down payment that what is really necessary. People often ask: “Can I get away with less than a 20% down payment?”. When a lender sends you a pre-approval or pre-qualification letter, they will normally indicate the maximum amount you can borrow. Now, just because you have this maximum amount they can lend you doesn’t mean you have to max it out. Lenders follow certain guidelines to determine what you can borrow, such as the 28/36 rule. This rule says that the homeowner should spend no more than 28% of their gross monthly income on housing expenses, and no more than 36% on overall debt. Keep in mind that buying a home also comes with material upfront costs, such as the down payment and closing costs. You’ll want to make sure that you have some money left for emergencies and other unexpected expenses after you close on your new house. It’s easy to lose yourself in the excitement of searching for a new home that you overlook some crucial bits of information about the neighborhood you would move to. For example, the kind of area where the neighborhood is, future developments in the area and the resale value of your home. As a first-time homebuyer, the thought of selling your home in the near future might not occur to you. But you should take that into account. Buy your house with the possibility of reselling it with some ease should your plans change in five years. One more thing: don’t become obsessed with buying that charming or quirky house until you have some sort of financial stability and can comfortably afford the charm. It is important to think about the long-term effects of your decision to buy that home. For example, if the neighborhood is undergoing some redevelopment, then your property could appreciate in the near future. However, if you buy an older home in the hope that it will appreciate in value, you have to realize that your investment could be a risky move. Unmistakably, buying a home can be a long and frustrating process. These days, starter homes move fast and it’s common for first-time homebuyers to experience rejection on the first offers they send out. During this situation, the tendency is to fall in love with a house that’s over your budget, or compete in a bidding war and end up paying more than what you’ve set as your limit. It is normal to feel some excitement when you think you’ve found your house – but don’t put yourself in a compromising situation. Sure, you’d rather do something else than spend your time looking for a great mortgage lender but this is something you must do. 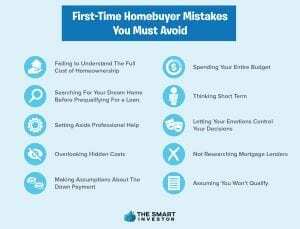 More so if you are a first-time homebuyer who has no idea how to go about it. A seasoned mortgage lender will be able to help you set your goals and get a loan that’s within your budget. What’s more, if you find someone you can trust, you can feel more confident in their rates and their advise to protect your finances. For a decision as life-changing as this, it is important that you deal with someone you can really trust. So, it really helps if you can get referrals from friends and family – and ask the right questions. For example, find out if the lender has the habit of surprising borrowers with hidden fees. Is he easy to work with and responsive to the needs of his customers? Honesty is also important, so check if they made good with the locked rate that they promised. These questions will help you get a sense of whether you can bet your time and money with a particular lender. Many borrowers lose heart when they realize that they can’t come up with the 20% down payment for their dream house. What they don’t know is, you could get a really nice house with the kind of money you are putting down in rent every month. Try punching in some numbers on an affordability calculator to get a better sense of what you need – and how much you can afford. Better yet, talk directly to a lender to find out exactly what you can qualify for. For the majority, a 20% down payment is ideal but you don’t necessarily need to put in that big a down payment to buy a house. You can look for loan programs that cater to first-time homebuyers such as the FHA loan. Here, you can get purchase a house for as little as 3.5% down payment. If you look really hard, you might find some conventional lenders that will allow only 3% down payment. And some special programs, such as VA loans for US veterans and military members and the USDA loans for rural areas, do not require a down payment at all. Buying your first home can give you stress and overwhelm you – plus it exposes you to a lot of potential pitfalls. If you become aware of those issues ahead of time, you can avoid the mistakes and go about with some level of confidence. For many people, a home is probably the biggest purchase they will ever make in their life. But if you have adequately prepared for the task, it need not be the most difficult one.